When most people think of Samurai warriors, images from Akira Kurosawa’s epic film Seven Samurai, come to mind. The film, which served as the basis for the classic western The Magnificent Seven, introduced the West to the warriors of pre-modern Japan. Now a new coin series provides an even more powerful glimpse into the history of Japan’s famous Samurai warriors with a release dedicated to the most influential Samurai to ever live – and the bloody legacy that haunted him until his dying day! Struck in one ounce of highly-pure 99.9% silver, this legal-tender coin depicts Taira no Kiyomori (1118-1181), who established Japan’s first Samurai-dominated government. Kiyomori, who despite never taking the title of emperor himself, dominated the country’s politics and was Japan’s de facto ruler for more than two decades. His rise to power was chronicled by famed Japanese artist Utagawa Hiroshige in his masterpiece Taira no Kiyomori’s Spectral Vision completed in 1845. 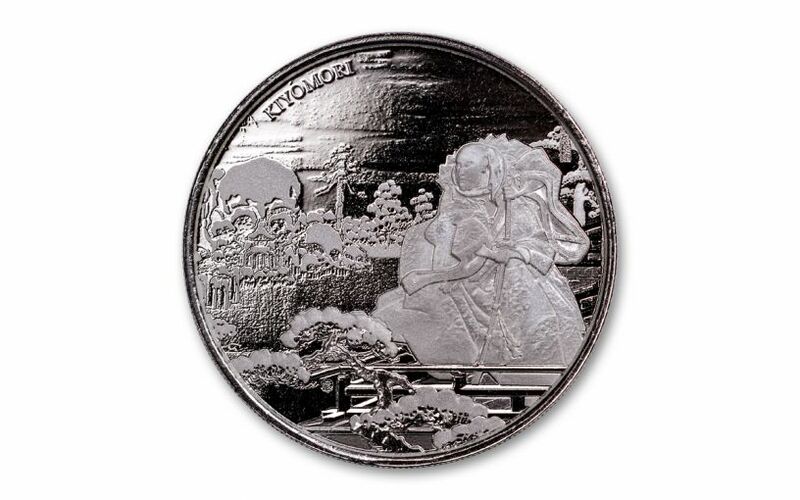 A portion of that woodblock painting is featured on the reverse of this coin. In this design, Kiyomori is depicted as haunted by his past deeds surrounded by eerie, snow-covered skulls in an artistic interpretation of all the bodies Kiyomori had to step over to get to the top. Superbly struck by the Scottsdale Mint and released by the Republic of Fiji, the 2018 Samurai Kiyomori One-Ounce Silver Coin comes in gleaming Brilliant Uncirculated (BU) condition, meaning that it is the product of a superb strike that places it firmly among the elite of the run. It’s an incredible silver bullion coin that is remarkable not only for its exceptionally skillful design, but also for its worldwide edition limit of just 15,000 – a remarkably small mintage for a world bullion coin! FIRST RELEASE IN A NEW SERIES – This coin is the first release in a new series that pays tribute to the artistic masterpiece Taira no Kiyomori’s Spectral Vision. The design shows a small portion of the woodblock painting completed by famed Japanese artist Utagawa Hiroshige in 1845. The coin’s obverse shows Fiji’s coat of arms surrounded by a decorative edge. STRUCK IN HIGHLY PURE SILVER – Each 2018 Fiji Samurai Kiyomori Coin is struck in an ounce of highly-pure 99.9% silver. 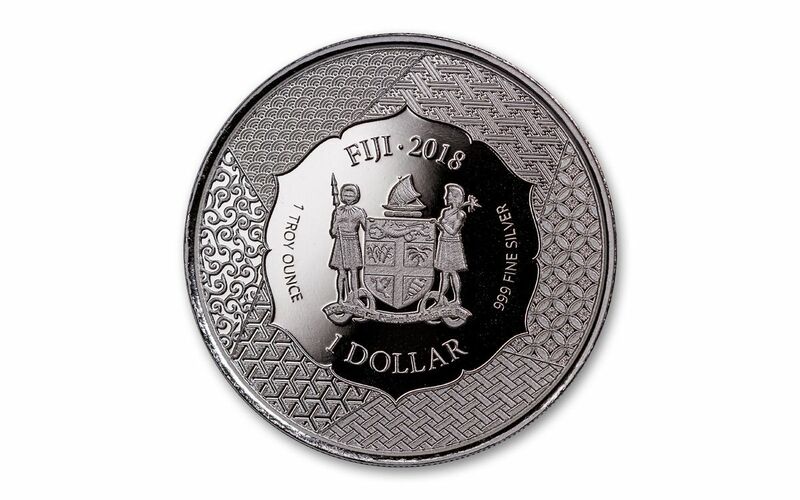 LEGAL TENDER COIN – These 2018 Fiji One-Ounce Silver Samurai Kiyomori Coins are $1 legal tender in the the Republic of Fiji, an island nation in the South Pacific Ocean. GORGEOUS BRILLIANT UNCIRCULATED CONDITION – Your 2018 Fiji One-Ounce Silver Samurai Kiyomori Coin will come in gorgeous brilliant Uncirculated (BU) condition, meaning that your coin is the product of a superb strike that places it firmly among the elite of the run. LOW LIMITED EDITION – The maximum worldwide edition limit for this coin has been set at just 15,000. Firsts are always important, and with just 15,000 of these extraordinary coins available, you’ll need to act fast. Get the first coin in this exciting new series by adding the 2018 Fiji Samurai Kiyomori One-Ounce Silver Coin to your cart today!